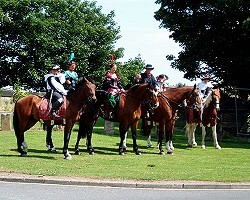 We gather at the parade starting point, along with everyone else in the parade, including this group of wild west cowboys and cow girls on horseback. It was such a beautiful sunny day, though rather too hot for marching. 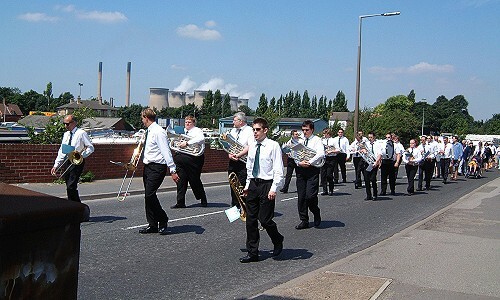 With the Band's rehearsal home, Ferrybridge 'C' Power station in the background, I jump out of the line-up during a short break to take this photograph of the Band once again leading the procession round the streets of Knottingley. Possibly brought out by the supurb weather, it was a pleasure to see so many people lining the route of the parade. 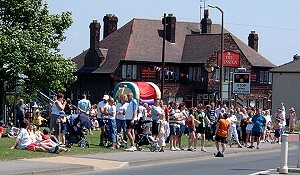 Some of the floats in the parade. 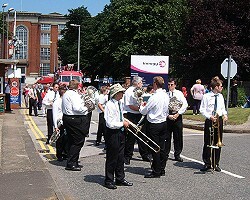 A fuller review of this event can be found on our Past Events 2003 page. Page updated: Saturday 8 April 2006.